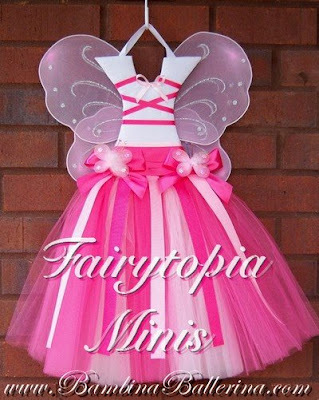 Trisha of Bambina Ballerina has created a product that is sure to be a hit with every little princess in your life. How did she do it? Well she brilliantly combined three of the hottest things out there right now . . . fairies, tutus, and hair bow holders. These works of art are both beautiful and functional. The Fairytopia Hair Bow Holders come in two sizes. The minis are quite affordable at under $45 each and are 15" to 17" high. How thrilled would your little girl be to wake up to one of these hanging on her wall every morning? I know it would put a smile on my daughter's face. 1) The selection of bow holders is not limited to the Fairytopia Collection. 2) Custom orders are accepted. If you are planning to order one for a gift, think ahead because it could take approximately 2 weeks for your handmade item to be created. Take a look at all the fun ways you can customize your bow holder, including turning it into a headband holder. 3) Gift certificates are available in the amounts of $30, $50, $75, and $100 and can be emailed to the recipient. As always, website owners who have an item featured as an ABOG Top Pick are welcome to display the badge on their website or blog.